Some of Europe's biggest train companies are teaming up to compete directly with airlines. 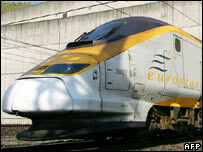 Railteam is an alliance of nine high-speed train companies across seven European countries. Eurostar, Germany's Deutsche Bahn and France's SNCF as well as the Dutch, Austrian, Swiss and Belgian rail operators have signed up to the scheme. They claim they will offer the best possible price available at the time you buy. They will also recognise each other's customer loyalty schemes and, in future years, will try to co-ordinate their timetables. Up to now, airlines have had one big advantage over railway companies when they operate on international routes. They sell you a ticket all the way to your destination - even if you have to change planes. Europe's railway tracks may all join up - but up to now, the ticketing arrangements haven't. Now, bosses of some the fastest train services in Europe have decided they're going to change that. Attending the launch in Brussels were the chief executives of Eurostar, Deutsche Bahn, SNCF, SNCB - the Belgian operator - , Holland's NS Hispeed, Austrian network ÖBB, Switzerland's SBB and subsidiaries Thalys, Lyria and Alleo. Between them they link more than 100 major towns and cities in western Europe with more than 5,000 kilometres of high speed rail track. Bookings can be made in all the usual ways offered by each train company: at offices, over the telephone and through the internet, hopefully defeating language barriers. So far, the network links seven countries, but the alliance is hopeful other rail companies in Europe will apply for membership of this new club. "Why would we want to keep them out?" asks Richard Brown, Eurostar chief executive. "As long as their trains are fast enough and they meet our standards of service, it's in our interest for them to join". The Railteam partnership between the continent's high-speed operators draws much of its inspiration from the alliances between different airline groups. If one operator doesn't serve a particular destination at the time a passenger wants to travel, it will try to complete the journey using the services of its partners. If a train is late and a passenger misses their connection, tickets will be valid on the services of other Railteam partners serving the same route. For regular travellers who enrol in loyalty programmes there are more than 30 business lounges to make waiting for a train more enjoyable. Guillaume Pepy, the chief executive of the French railway network SNCF, believes the Railteam network will tempt as many as 10 million new passengers away from airlines and onto the rails. "European speed trains run at 320 kmph (198.7mph) and that makes railways perfectly competitive with airlines, especially when you consider that we travel from city centre to city centre. "Now we have interconnected the sales system so that you will be able to get the best available fare no matter where you are living." Whether the airlines will regard their ground-based rivals as true competitors remains to be seen, but industry watchers say they should take the threat seriously. 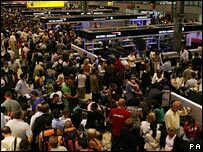 Cathy Buyck, editor of Air Transport World Magazine, says security fears are another factor which could drive passengers away from airports. "If you see how easy it is to travel by train and how difficult it is to travel by plane, they clearly have an advantage. You simply pack up your suitcase and you take your train at the station and you go. "I think the hassle factor of travelling by train these days is a very big difference." Another issue of the moment that could work in the railway's favour is climate change. With Governments increasingly keen to do all they can to show their green credentials, the Railteam group are keen to point out that rail travel emits on average a tenth of the carbon dioxide emissions of flying. Cross-channel train operator Eurostar has already said it will become carbon neutral and offset any emissions it cannot eliminate. Can the railways steal business from low-cost airlines?